This may sound crazy to those of you who can easily whip up the perfect stack of pancakes, but for years I tried and failed to make a thick and fluffy batch. I tried lots of different recipes and different pans to no avail. Our weekend mornings would turn into piles of thin pancakes that were cooked on the outside and wet in the middle. I’d be left sitting frustrated with a mess of dishes to clean up while Taste Tester would politely eat up my lame pancakes and try to convince me that they were delicious. - Whisk the wet mixture vigorously so that your beatened eggs help make the pancakes fluffy. - Once your wet mixture has been added to your dry, do not over-mix. Lumps make for fluffy pancakes. - Fry up the pancakes in a stainless pan in vegetable oil or clarified butter. You may think I’m crazy for this one but I had tried a few different non-stick pans and even a griddle. I’d add butter and wipe it away with a paper towel as many recipes instruct you to do, with the same result every time: toasted pancakes with undercooked interiors. Vegetable oil may be a bit higher in calories than you’d prefer but if flavor and texture are your priority, give it a shot. They will be super fluffy with crispy edges! Use just enough to coat the pan to prevent sticking. - I’ve never tried this tip before but, I’ve read that swapping beer for half he liquid in pancake batter makes them extra-fluffy, with a rich, yeasty aroma. For your morning dose of CPB, you could also add some chocolate chips into the batter along with the sliced bananas and top with regular peanut butter. 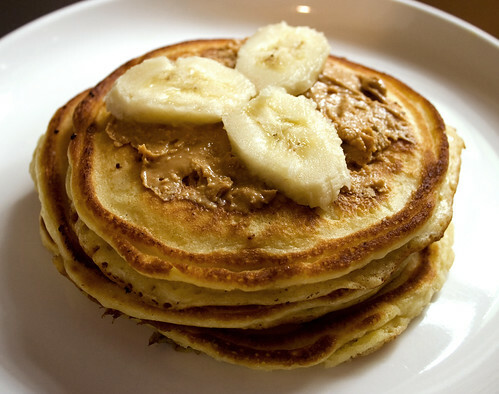 Aside from tasting delicious, adding peanut butter to your pancakes will help you stay full throughout the morning. Adding chocolate chips will make you feel like you’ve just eaten dessert for breakfast! It’s the perfect weekend splurge. I hope this post helps any pancake-challenged folks like myself. You’re not alone – just take a deep breath and pick up the spatula. You can do it! peanut butter & chocolate chips! 1. In a medium bowl, sift together the flour, sugar, baking powder, and salt. Whisk together the sour cream, milk, eggs, vanilla, and lemon zest. Add the wet ingredients to the dry ones, mixing only until combined. 2. Heat a stainless pan coated with vegetable oil over medium-low. Ladle the pancake batter into the pan. Distribute a rounded tablespoon of bananas (and chocolate chips, if desired) on each pancake. Cook for 2 to 3 minutes, until bubbles appear on top and the underside is nicely browned. Flip the pancakes and then cook for another minute, until browned. Add more vegetable oil to the pan, and continue cooking pancakes until all the batter is used. Serve with sliced bananas, butter, peanut butter and maple syrup. *I’d link directly to the recipe, but it looks like it’s been removed from their site. My 8 year old decided she likes pancakes. I hardly ever eat them, but they’re fun to make and I was happy she’d requested them. I am sad to say, we didn’t make yours because the kid doesn’t care for peanut butter or bananas, but thanks for posting the pancake making tips! This morning we made a batch using a standard buttermilk pancake recipe. They tasted great, but I had that same problem you did with the pancakes cooking too quickly on the outside. I used a buttered stainless steel pan and kept adjusting the temperature, yet my butter either smoked from the pan being too hot or it just wasn’t hot enough. So what I’m trying to say here is I LOVE your suggestion of using clarified butter or oil. I thought maybe I’d have better luck with a non-stick Teflon pan, but I’d rather stick with (no pun intended) my stainless steel pan that I use for everything else. Make by mixing dry, mixing wet, adding wet to dry etc. This one’s from Southern Living. These look so good! One thing I’ve done since I first started making my husband pancakes as a newlywed (some 34 years ago): Whip the egg whites first. The pancakes turn out amazingly light! wow. I cannot think of a better way to start off the morning. 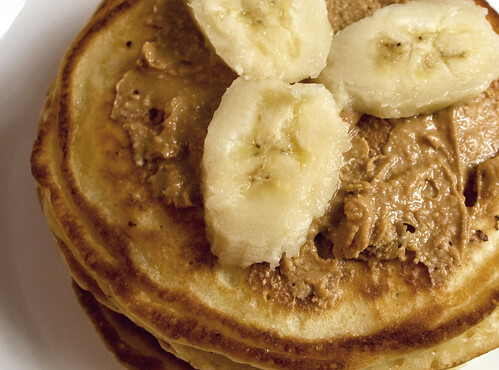 Seriously the best of all worlds – banana, peanut butter & pancakes!